by Housewife on a Mission and sponsored by Little Tikes! Spring is just around the corner, and to celebrate one lucky person is going to win a new Cozy Coupe Sandbox from the Little Tikes! Your little one(s) can have hours of fun in this sandbox, building sand castles and more! What fun for imaginative play outdoors! My daughter would a field day with this! I am so excited to share this opportunity with all of you! 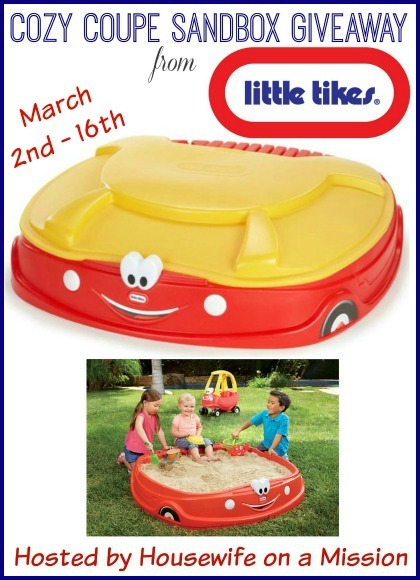 One lucky person is going to win a Little Tikes Cozy Coupe Sandbox! I want to win because I have an 18 month old grandson who would love this. I would love to win this for my grandson's birthday. He will be 2 in April. I would love to win this for our 2 grandsons...they would love it! I want to win this for my 16 almost 17 month olg grandson & my 24 month niece that I care for.Little Tikes makes the best products,and leaves the little ones with hours of endless fun.Thanks so much for the fantastic giveaway.Good Luck All!! I want to win this for my 2 toddlers plus I do a lot of babysitting so it would be a fun activity for all the kids to be able to do in the summer time! I want to win this for my three year old daughter she will have a blast with it.